The fire principle radiates like atomic warmth from the chakra at the umbilicus, in oval waves, outward, and creates the vital aura of devotion shown in pictures of the saints. When stepped down it works thru [through] the sympathetic nervous system as autonomic function, to sustain the body. See Chart 2 in this series. The airy element is illustrated in Chart No. 12 of this series. It works thru [through] the parasympathetic system, above and below, from the outside in and out. Air expands and locks up function in tissues, causing spasm and pain anywhere. It acts as a brake to the motive energy, like an air gap in conduction. Most pains are due to expansion and gas formation in tissues before the actual gross accumulations occur. Great relief can be given by removing these energy blocks and closing the wireless gap by means of polarity application over the polarity regions, above and below, as shown in Wireless Anatomy and in Polarity Therapy, as well as over the parasympathetic regions shown here, for specific response. This is a simultaneous contact with one hand above and the other below. See Chart No. 4, page 11 in Wireless Anatomy. Stimulating the fire and water principles by polarity, in their local fields, will move the airy blockage by flowing thru [through] it. 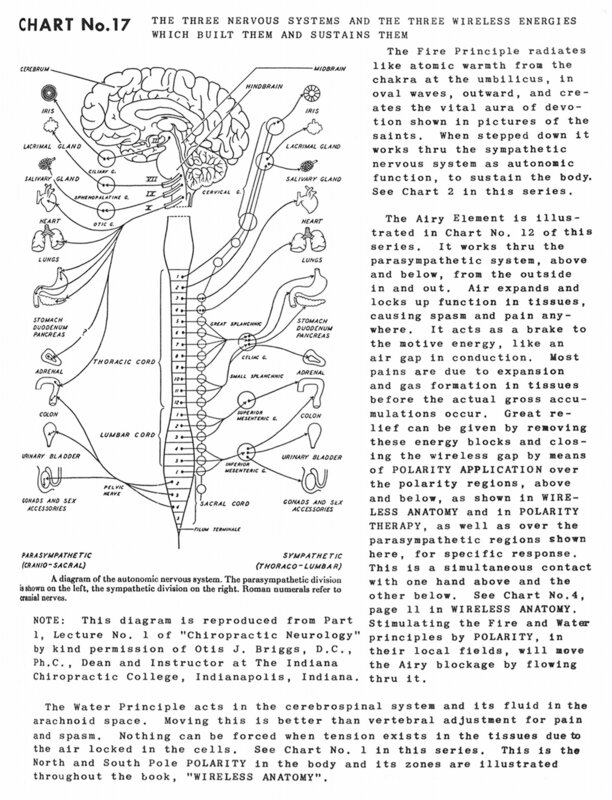 The water principle acts in the cerebrospinal system and its fluid in the arachnoid space. Moving this is better than vertebral adjustment for pain and spasm. Nothing can be forced when tension exists in the tissues due to the air locked in the cells. See Chart No. 1 in this series. 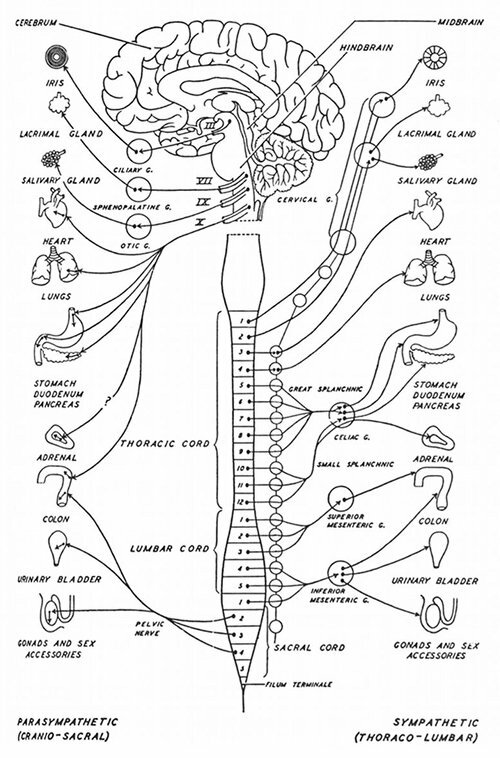 This is the north and south pole polarity in the body and its zones are illustrated throughout the book, "Wireless Anatomy". A diagram of the autonomic nervous system. The parasympathetic division is shown on the left, the sympathetic division on the right. Roman numerals refer to cranial nerves. Note: This diagram is reproduced from Part 1, Lecture No. 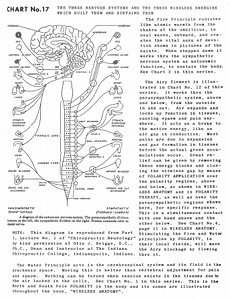 1 of "Chiropractic Neurology" by kind permission of Otis J. Briggs, D.C., Ph.C., Dean and Instructor at The Indiana Chiropractic College, Indianapolis, Indiana.